In 2007, I took a vacation to a small green cabin in Northern Michigan. The setting inspired me, and I wrote most of the first draft of The Haunting of Cabin Green: A Modern Gothic Horror Novel while sitting inside the cabin. During the next 10 years, I launched a career as a Dark Art photographer, became a full-time content writer with bylines on well-known horror sites such as Bloody Disgusting, and published two Kindle Short Reads (the Midnight Myths and Fairy Tales series). I finally dusted off that first draft 10 years later and found a story that I very much wanted to tell. Many revisions and additions later, my debut horror novel is now set to come out on April 17. Halloween is my favorite holiday and the autumn season in Northern Michigan is stunningly beautiful. Therefore, setting my novel during the month of October was a natural fit. Choosing horror for my debut novel was also natural as I’ve been in love with all aspects of the genre since early childhood. I grew up watching Michael Jackson’s Thriller music video, reading spooky mysteries by John Bellairs, and watching the Detroit area’s Thriller Double Feature on Saturday afternoons. Most of the books I read now are in the horror or thriller genres. Some of my favorite authors include Clive Barker, Mark Edwards, Josh Malerman, and Ania Ahlborn. Much like them, I enjoy pushing boundaries and looking for new ways to tell scary stories, even while using classic horror themes such as ghosts and a cabin in the woods. Welcome to Cabin Green, where the setting is familiar, but the story is completely unexpected. This original, terrifying psychological thriller is the debut horror novel from the author of the Midnight Myths and Fairy Tales series. 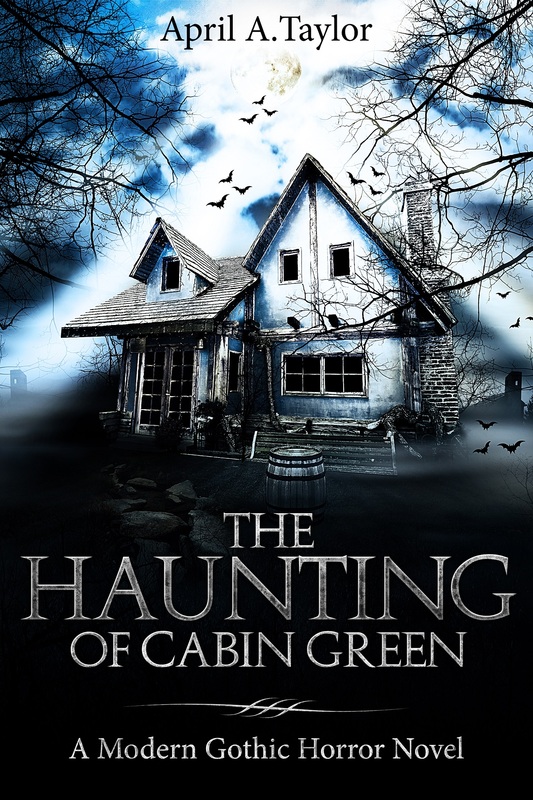 The Haunting of Cabin Green: A Modern Gothic Horror Novel is available in the Kindle format. Pre-orders started on March 17, and the response has been truly humbling. Horror fans have supported my writing and photography in many ways over the years, and I’m so grateful to have their support again now. A paperback version will also be released in a few weeks. Kindle Unlimited subscribers can read the book for FREE! I love to hear reader feedback, so please leave a review on Amazon and Goodreads or drop me a line by visiting my website. Thank you! April A. Taylor is an American author and an award-winning Dark Art and Fine Art Photographer. Both books in her Midnight Myths and Fairy Tales series became a #1 best seller in Amazon's Canada store during March 2018.Like many writers, she started putting pen to paper during early childhood. Her first project was a family newspaper entitled The Taylor Family Times. Since then, she's spent more than three decades honing her craft through a wide variety of fiction and non-fiction projects.April's appropriately spooky black cat, Riley, is her toughest editor and critic (look for pictures of him in action - and sleeping on the job - on Instagram! ).Horror caught her attention at a young age, and she's enjoyed exploring the darkness hidden inside everyone’s psyche ever since. She's also intrigued by each person’s capacity for astounding levels of goodness in the face of overwhelming evil.April's horror, paranormal mysteries, and dark, reimagined myths and fairy tales tackle both these topics. The darker side of humanity is also on display inside her Fine Art and Dark Art photographs, which have been published and exhibited around the world by a diverse list of media sources such as Fangoria, Scream: The Horror Magazine, and the short horror film Cathartic.She currently lives in Michigan with the love of her life and their two cats. April is an Active (professional level) member of the Horror Writers Association. If her life was a cartoon, she'd be Lisa Simpson.